Hillsborough, North Carolina is the place to be! It is a charmingly small, southern town with a modern flair; just minutes away from the hustle and bustle of The Triangle area. Enjoy a lively arts and culture scene, stunning architecture and scenic beauty when you stroll through downtown Hillsborough. It has been voted one of the top 10 coolest small towns in America and you’ll understand why as soon as you visit. There is always something to do when living in Hillsborough, with community events, historic locations, festivals, art walks, live music, the farmers market, locally owned businesses and restaurants, and so much more! If you’re a big foodie, there’s no better place to call home. Taste Carolina Gourmet Food Tours is the best way to experience the top food destinations around North Carolina. Join one of their tours, and experience the amazing and unique food options Hillsborough restaurants and shops have to offer. Their tours focus on farm-to-table cuisine, so you can be sure to get something fresh and delicious! Looking for more of that fresh food? Then head to the Hillsborough Farmer’s Market every Saturday in the summer from 8:00 a.m. to noon. The market features products from local farmers, bakers, crafters, and other artisans. You’re sure to find something amazing, while supporting your community. Love wine? Cross the street from the market and step into Hillsborough Wine Company. The staff definitely knows their wines and is ready to help you find whatever you’re looking for, from budget friendly to top shelf. The store also features a wine tasting machine, allowing you to choose your wine and tasting size on your own time, with selections changing all the time. There’s no better way to spend a lazy afternoon than lounging on their sofas, sampling some of the best wines around. Are you more of the outdoorsy type, or just looking to burn off all the yummy food and drink you’ve been sampling? The Occoneechee Mountain State Natural Area is the perfect place for you. This 190 acre beauty features naturally wooded picnic areas, quiet ponds for fishing, and hiking trails reaching 867 feet in height, the highest spot in all of Orange County. It is the perfect place to spend a quiet day of self-reflection or take the family to enjoy all that nature has to offer. If the outdoors aren’t quite your scene, you can always spend your day shopping. Find something wonderfully unique at one of Hillsborough’s locally owned stores. If you’re more interested in going to the mall, The Streets of Southpoint in Durham and the Tanger Outlets in Mebane are a quick drive away, providing you with even more options for shopping, dining, and activities such as the movie theater at The Streets of Southpoint. Living in Hillsborough, North Carolina allows you proximity to two of the most renowned universities in the nation! Sitting on 8,600 acres in Durham, North Carolina, Duke University is home to over 14,000 undergraduates, graduates, and professional students. The University of North Carolina at Chapel Hill is also just minutes away and houses over 28,000 students. The biggest thing these two universities are known for to some, however, is their basketball rivalry. Sitting just a mere 9 miles apart, Duke and UNC have two of the best division one men’s basketball programs in the nation, winning 27% percent of the national championships in the past 30 years. This proximity and the high quality of both teams have led to the #1 ranked college basketball rivalry in history according to Sports Illustrated. Sports enthusiasts will never go bored in this area, no matter which shade of blue they choose to cheer for during those nail biting rivalry games. Ashford Lakes' convenient Hillsborough location is between interstates 85 and 40 with easy access to downtown Hillsborough, Raleigh, Durham, and Chapel Hill. Ashford Lakes Apartment Homes is a unique retreat for its residents, allowing them access to everything Hillsborough has to offer. Ashford Lakes sits on 27 naturally wooded acres, with a 5 acre fishing pond in the heart of the community. The in-ground resort style pool overlooks the pond, giving you the illusion you are always on vacation when laying by the pool. Our Hillsborough apartments for rent feature one, two, and three bedroom garden style floor plans, as well as two and three bedroom townhomes in Hillsborough, NC. Anyone, from first time renting students to full families looking for a long time residence, must come see Ashford Lakes. All our apartments feature gourmet kitchens with granite-style countertops, white cabinetry and optional stainless steel appliances. Apartments are equipmented with everything you’ll need, including your own set of full-size washer and dryer. Enjoy a private entry, walk-in closets with built-in shelving and a screened-in patio or balcony. We have many options for living, including furnished apartments. 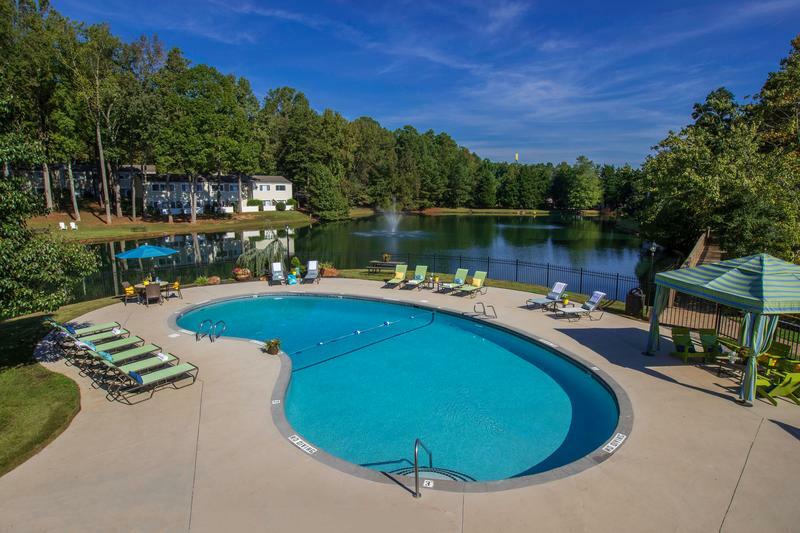 You’ll love that Ashford Lakes is pet-friendly! We welcome breeds of all sizes and love to see the pups run around in our off-leash dog park with agility obstacles. When you’re looking for a break or want to go for a swim, head to our sparkling resort-style pool to lounge in the sun or relax in the shade under one of our cabanas. It will be fun for the whole family with picnic and grilling areas, as well as a playground for sliding, climbing and more! If you need to get in shape, our 24 hour fitness center will be your go-to place to fit in your cardio workout or strength training. If you want to go for a jog, our staff will happily point out the walking trail around the property. Schedule a tour today of our Hillsborough, North Carolina apartments to come see your future home.